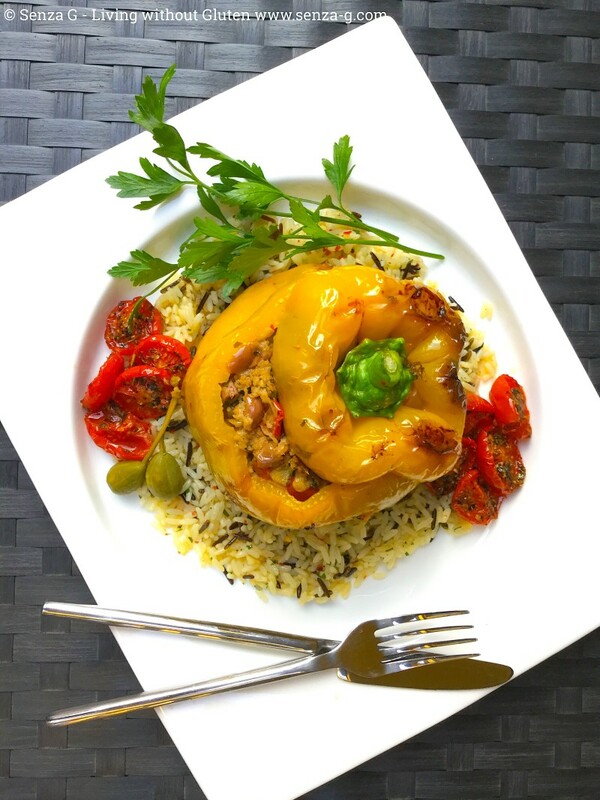 There seems to be so many different versions when it comes to stuffed peppers. Many fill them with a mix of rice and veggies, or with couscous and quinoa and many with meat too. This is the way my mother always made hers. Oh and the smell whilst they were cooking … heartbreaking. I had to obviously use gluten free fresh breadcrumbs. It did taste a little different than my mum’ss, obviously back then still undiagnosed. But still so good. Wash and dry the peppers, cut off the top with the stem, but reserve it if you wish to use it as garnish. Remove the pith (you can use a pair of scissors) and seeds from inside. Set aside. Saute the onion in a little olive oil and when it is translucent, add the garlic and cook until fragrant. Add the tomatoes, the chopped anchovies, the olives and capers and cook for a couple minutes. Remove from the heat and add the fresh breadcrumbs, the chilli flakes and the parsley. Combine well and season with salt and pepper. Be easy on the salt because of the anchovies. So taste before adding more. Stuff the peppers with this mixture. Heat some olive oil in a large pan and very gently place the peppers on their side. Some filling will fall out, just try stuff it back in. Add also the reserved tops. On a low flame, keep sauteing the peppers, turning them occasionally so they brown on all sides.